Restaurateur Ritu Dalmia has come full circle since her opening first restaurant in Hauz Khas Village, almost two decades ago, and Diva Piccola, her new café venture in that neighbourhood. Not only does Dalmia have the comfort Italian formula down pat, nowadays the mere fact of existence in HKV implies being too hip to fail. It’s not surprising then, that the food at this cozy eatery with an open kitchen, picture windows and quick service, is also excellent. The menu is succinct: appetizers, pastas, pizzas, paninis and three main non-vegetarian courses, and of course, desserts. Eggplant and haloumi wrapped in ciabatta crumb turned out to be three gratinated and reconstituted baingan and cheese tikkis, nicely spiced and served with a delicious scraped-up salsa of tomatoes and basil. An order of six crispy prawns, each nestled in a brown paper cone, very lightly battered and fried, and served with a lemony rosemary olive oil and drops of caramelised vinegar was very snackable, though we found ourselves wishing we’d ordered the heap of mixed greens at the neighbouring table. The green quotient was easily filled by our pizza, an off-the menu recommendation from an extremely enthusiastic and helpful member of the staff (he described a Bailey’s mousse cake as “orgasmic”). All the pizzas sound brilliant, and we enjoyed our verde prosciutto hybrid: pesto sauce, mozzarella, high quality Parma ham, a salad of rocket leaves and a liberal garnish of pine nuts. Gooey and crispy in all the right places, this is certainly the best pie you’ll get in the Village – maybe even in the city. We also tried the pork piccata, perfect for those with bigger appetites: a browned cutlet topped with cubes of fried pink ham, in a red wine reduction with white whole moons cut out of a potato for embellishment. We’d recommend sticking with pizza or pasta, but only because you’ll want to save space for dessert. The mousse cake was very good – thick with cream and solidly rich, though, we felt, a little too precise to qualify as “orgasmic”, as someone a table deemed it. A panna cotta with blue berry sauce was also well turned out, a small quivery mound flecked with vanilla, next to a streak of purple coulis. We might have liked the desserts a bit messier – they seemed more appropriate to a five star hotel patisserie than something from Dalmia’s typically personal kitchens – but that’s not a complaint. And “loosen up a little” is certainly not a suggestion you could offer most restaurants in the city. 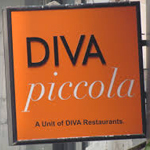 Diva Piccola 30 Hauz Khas Village, First Floor (4053-6001). Originally published in Time Out Delhi, April 2012.